The programme supported community-based water supply and environmental sanitation projects in multi-ethnic settlements in Crimea. Skat contributed to the elaboration of a strategy for community health and infrastructure measures and streamlining the SDC-financed community initiatives. It also reviewed other relevant approaches towards community-based communal services provision and assisted in their consolidation, mainstreaming and up-scaling. 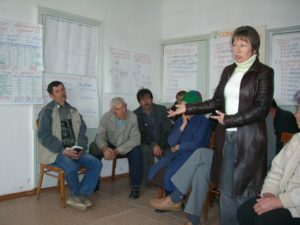 CIDP supported a bottom-up, participatory decision-making framework for development that encourages local community members across Crimea to identify and prioritise their needs vis-à-vis local development improvements and establish local strategies to ensure that such initiatives are sustainable. Furthermore, the programme provided selected communities with the necessary resources and support to implement and effectively manage infrastructure or social service improvements which meet self-expressed local development needs and priorities. Two pilot projects for sustainable community-based water supply were successfully implemented in the Bakhchisaray Region.